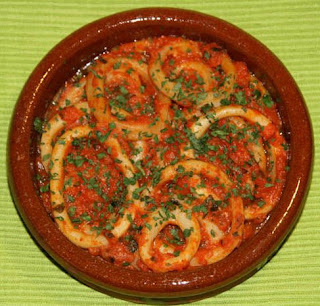 “Calamari a la Catalana” is one of the typical meals in my region of Spain. I miss a lot this typical meal of my little county, Catalonia (in Spain). When I got up on Saturday morning, I felt as though it were spring in my little Catalonia. I felt the strong sun that brings heat and I reminisced about a day with some friends cooking “Calamai a la Catalana” (Squid cooked in the Catalan style). I used to go with my friends to San Carles de la Ràpita. One of them had a house on the beach. She called it “El Chalet”, and her boyfriend was a really good cook. Some of us went to the market and we bought one kilo of squids, onion, garlic, some tomatoes, and the salesman gave us some fresh parsley. We came back to El Chalet, in our way of talking and laughing at nonsensical things and feeling happy. When we arrived at the house, some of my friends were in bathing suits ready to swim into the sea, and others were waiting for us to start cooking. So, our good cook started to prepare the Calamari a la Catalana. He was the chef and the others the assistents. First you need to clean the squid very well and cut it in slices. Then you cut the onion in little pieces and carve 2 cloves of garlics and add the parsley. With the tomato you make a sauce (if you want you can grate the fresh tomato) or buy some tomato sauce. In a pan with olive oil, you mix all the ingredients: the sliced, the onion, the carved garlic and parsley, the tomato sauce, and a pinch of salt, and white pepper. If you like, you can add some cinnamon (not so much) and a glass of white wine. Then you cover the pan and let cook on low heat. You sometimes have to stir the pan. When the liquid is almost gone (it is better with a little bit of sauce) it's ready to eat...Enjoy the meal!!! I remember that we enjoyed it a lot, all together with some wine in the yard watching the sea and the warm sun in our wet backs, because all of us enjoyed the delicious Calamari a la Catalana, unless, of course, our good cook decided to go swimming into the sea instead of cooking for us.